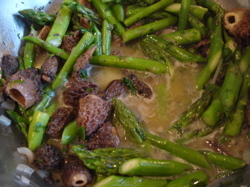 Completely inspired by the market last week, I picked up some asparagus and morels, not knowing exactly what I’d do with them. I was thinking risotto, but it wasn’t quite what I wanted texturally. I remembered an idea I’d read in thekitchn.com newsletter. 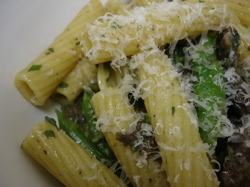 Sara Kate wrote that she cooks pasta and greens and then tosses it all, while hot, in a beaten egg. The hot pasta cooks the egg and the egg gives back a silky rich sauce. It seemed perfect for my asparagus and morels. And it was. Hopefully this wasn’t a one-time market find, but this technique will work for any number of pasta-vegetable combinations, with or without mushrooms. Peas, greens, artichokes anyone? Adding in some porky goodness like bacon or prosciutto wouldn’t be a bad idea either. Believe me it tasted better than it looks here in the poor light. Looks great. How much does the egg get cooked by the end? How much is still liquid? I’m interested in our (ie. a lot of the modern West’s) prejudice against eggs that are uncooked in any way. The media still seems to feed it, by exaggerating the threat of salmonella (I saw a figure of less than 1 in 40,000 free-range/organic eggs). And yet in China, no dish of noodles is complete without a raw egg broken on top. How very complicated we tend to make food. Thanks for participating on the blog. The pasta is very hot when it gets tossed in the egg, so it seems to me that it becomes thoroughly cooked. There is definitely no liquid left. The egg coats the pasta. Also, I use pastured eggs from my local farmers market, so I wouldn’t hesitate to eat them actually raw (like in a Caesar salad) but depending on the eggs you’re using, and the people you’re feeding (elderly, immune compromised, etc.) you might want to be careful. But I really feel the egg gets cooked thoroughly enough.